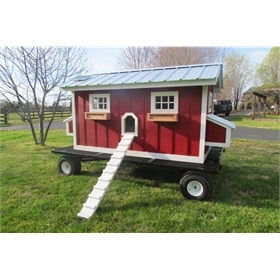 This custom coop is under the deck! Gingerbread House in the woods! 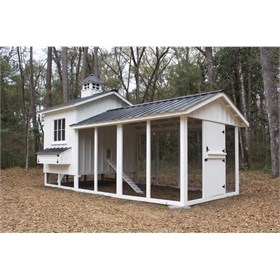 This one looks like a school house! 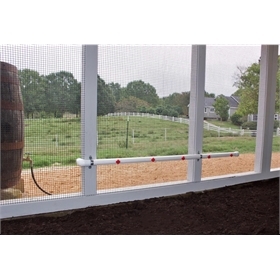 Do you want a coop customized to your exacting needs? 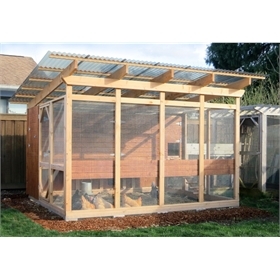 Would you like your coop to be crafted from sustainable, reclaimed, or special materials? 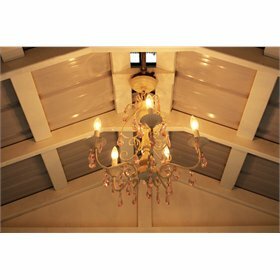 What about one that features all the bells and whistles, or one designed to match your Victorian architecture? Are you dying for a Mid-Century Modern coop... or something in Spanish Colonial? 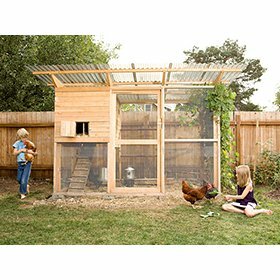 Look no more: Your chicken coop dreams have arrived--and they start at My Pet Chicken! 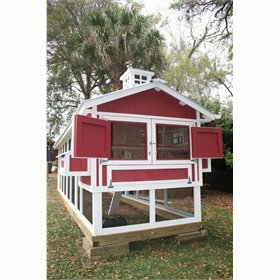 Our experienced craftsman and his crack squad of coop crafting commandos have designed and hand built hundreds chicken coops over the years, and they are ready to satisfy your any specification or fantasy. 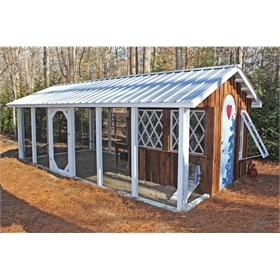 They will build your dream coop, then deliver and install it anywhere in the United States. Talk about Made in the USA! Not sure what you want, yet? 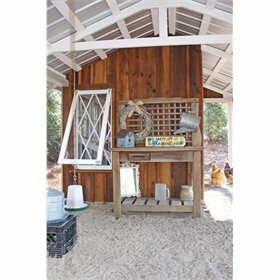 Browse our provided photos for some of his most beautiful and unique past designs: there's the chicken coop tucked neatly under an existing deck, the adorable gingerbread cottage in the woods, the French Quarter-style coop, a mobile coop on wheels, and more! Interested? 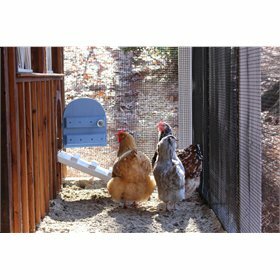 Please just give our chicken and coop eggsperts a ring so we can start exploring the possibilities together. Keep reading for more details and information! 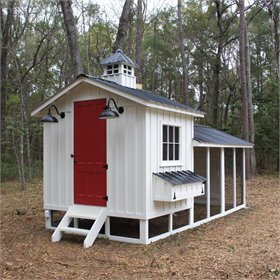 How much does your Fully Customized Coop cost? We wish we could give you an exact figure, but that all depends! 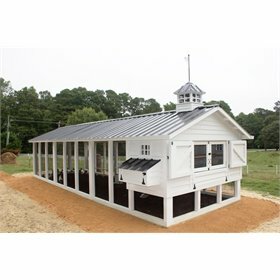 As you can see from the photos above, the sky's the limit when it comes to options like the size of the coop, the materials and finishes used, and so on. 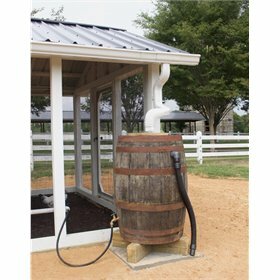 Because our price includes not only hand-delivery, but also prepping the ground/underlayment as well as full assembly of your coop, at a minimum you should plan on around $10,000. 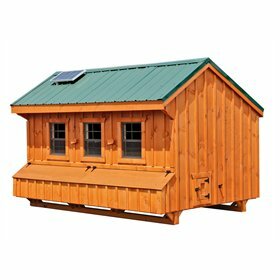 What kind of options will be offered on my coop? 110 amp AC electric, for fans, lights, heating devices, automatic doors, etc. 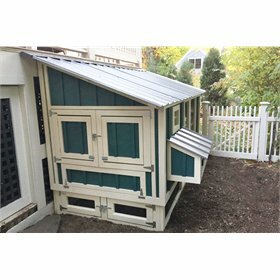 How long will my coop take to build? Depending on the time of year and the complexity of the build, it usually takes 4-6 weeks to complete. Are shipping and assembly included in the price? Yes! 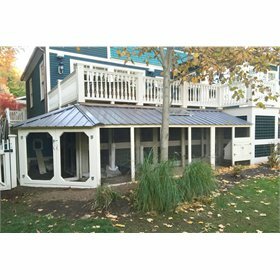 Our build team handles your order from soup to nuts, and the quote you receive will include everything including the build, shipment, and installation. You won't have to worry about a thing. 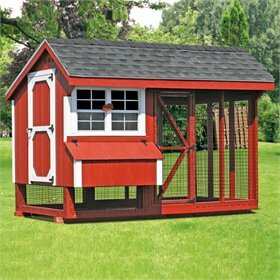 After you've let us know you're interested in the Fully Customized Coop, you'll start by telling us your chicken coop fantasies! Tell us what you want for your flock. You can also send us pictures or links to styles that you like, if you have them! Once we have your basic wishlist ready, we'll refer this preliminary information about your Dream Coop to the build team. They'll then get in touch with you. Together you'll zero in on nitty-gritty details, and they'll create a custom, 3D rendering of your dream coop and provide your quote. At that point, you'll be able to make further changes or approve the final design! How does payment for the custom coop work? 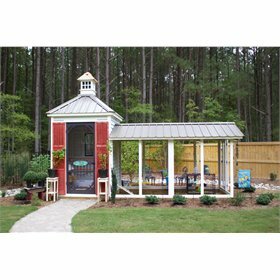 Once you've approved your unique coop design, you'll make a 50% down payment directly to the builder. The final 50% will be payable once installation is complete. Absolutely! Just ask, and we'd be happy to provide them. 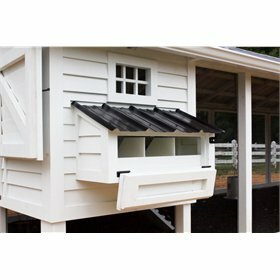 What do I need to do before my coop arrives? Just sit back and enjoy the design process. We'll handle everything. We're here to help answer them! Just let us know you're interested.